Postal workers at the Royal Mail will each be given bonuses of £1,074 after the mail service announced record annual profits of £537m. 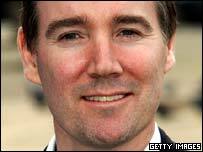 Royal Mail chief executive Adam Crozier has received a £2.2m bonus as his reward for leading the recovery. Over the past 12 months the state-owned operator made more than £2m a day in profits, compared with losses of more than £1.5m a day three years ago. Royal Mail chairman Allan Leighton said it was a "fantastic turnaround". Mr Crozier's £2.2m bonus accounts for all his work since he first took up the top role in February 2003. In addition, he has received a basic annual salary of around £500,000, taking his total pay since he joined the company up to £3.3m. The Royal Mail said two thirds of the £3.3m was performance-based, thanks to the Royal Mail meeting its targets. "By any standards our transformation has been huge," Mr Leighton told BBC Radio 4's Today programme. "Adam has led all of this. I very much believe that he deserves all the money he gets." First class mail deliveries are now the best in a decade, with 92.8% being delivered on time between January and March of this year, 0.3% above target. What do you think of the Royal Mail's turnaround? The 98.5% figure for delivering second class mail was improved by 0.2%, while the number of letters being lost was cut in half. The number of letters going missing fell from 28 million to 16 million last year, with 99.92% of mail arriving safely. "The big driver in all of this has been that we have been able to drive the volume of mail up. People said it would be difficult but that is what we have done," said Mr Leighton. "We made a lot of changes and service levels dipped, and we apologised for that. Now the results are the best in ten years, in terms of quality of service as well as profits." Turnover at the Royal Mail reached a record £8.96bn, while 84 million letters a day were handled, one million more each day than the previous 12 months. The £537m profit was a 144% rise on the previous year's £220m. Yet Royal Mail's Post Office subsidiary continued to make a loss, posting a deficit of £110m. Mr Leighton said there was still "a huge amount to do". Since Royal Mail started a turnaround plan three years ago, more than 33,000 jobs have been cut at the organisation, while 2,500 urban Post Offices have closed. The Communication Workers Union general secretary Billy Hayes said: "What we have seen today is a successful publicly-owned service." The Royal Mail group comprises four businesses - Royal Mail, Post Office, Parcelforce and General Logistics Service. While the Royal Mail handles the core letters business, General Logistics runs the European parcel delivery arm, and Parcelforce operates the domestic parcel work. Postal service watchdog Postwatch said the results were "encouraging", despite the Royal Mail failing to achieve 11 of its 15 licence targets during the last financial year. "While applauding Royal Mail for continuing its turnaround from serious loss-maker to profitable company, Postwatch maintains that an acceptable postal service will only have been achieved when all minimum licence targets are at least hit," said Postwatch. As an ex-postman, I have a better understanding of the situation and also as a business graduate. I think you will find the original 'poor' and 'terrible' performances of past years were false or at least debts heaped into short term. Now 'hey presto' all sorted! - excuse the pun. This is a seasoned management trick given the Royal Mail have a good frame work to start with. You will find TNT/DHL will now begin to sort the mail and RM deliver it. Sell off the sorting offices - more profits! We are not all fooled. Have you seen the queue in Manchester's main post office everyday? I don't see the service improving. I suggest the profits would be better ploughed into improving services such as these. Post is still dismal, trying to run a business and not receiving mail until as late as 1.00pm, sometimes 3pm is no joke. It's fine moving back into profit, but the customer's quality of early reliable delivery has been downgraded to very poor when judged against good standards of the last 150 years. The Post Office now needs to concentrate on earlier more reliable deliveries, moving the goalposts back to what we had been used to. To all those complaining about unreliable delivery times and the amount of time needed to deliver - if you want guaranteed delivery then you should be prepared to pay extra and use a private delivery company. The Royal Mail's remit is to provide affordable postage for the general public. Businesses and those that want faster service should either pay more, or accept more flexible levels of service. Never mind the quality feel the profits! The whole of The Royal Mail deserves a pat on the back for this excellent result. I may be biased as I am a Royal Mail employee and I personally deal with several thousand mail items a day. Yes, mail does get lost, but if you could see how much of the mail in just one day is badly addressed or not even addressed at all then you would appreciate the difficulties overcome by Royal Mail on a daily basis. I would like to point out that the price of a first class stamp has was only raised to 30p very recently, well outside to period for which the profits were announced. First Class personal post represents only a very small proportion of Royal Mail daily traffic in any case. Having spent 20 years in the Post Office I can quite believe that one man with a broad view on management and leadership can make such a difference. I left because I thought the majority of the senior board were not up to the job and were only in it to feather their own beds. Well done Adam. Well done to all Royal Mail workers. A complete overhaul in the last twelve months has given a well deserved reward to all posties who get up at the crack of dawn to deliver a world class service. A common mistake made by most people, is that a postman only has that bag on his shoulder, how wrong could they be. congratulations. Let's hope that they can focus on service next. It's good to see that they are making money, but in my area the level of service has fallen in the last 18 months. Some post never arrives and I get a lot of post for other addresses. We need more top executives like Adam Crozier. Top executives that can produce big results deserve, and should be entitled to, big rewards. So when does Adam Crozier start working on the railways? After that will he turn his hand to the manufacturing industry? All of this has come at a price to the current postmen and women. People are given longer rounds with more post to deliver in the same amount of time. It forced my Dad into early retirement as he couldn't keep up with the younger workers. He lost his local round that he did for many years, and the personal service he used to give to all of his customers was invaluable. I bet that hardly anyone has a regular postman anymore and doesn't even know their name. Fantastic news. No need to privatise it then. Hardly surprising with the closing of so many post offices. In Eastbourne and Croydon, where I work, the queue is usually 15-30 minutes wait. The number of wasted man hours because of people waiting in post office queues must be enormous! On the whole I think the Royal Mail do a pretty good job, although clearly improvements are needed, such as significantly reducing the number of lost articles, and earlier delivery times, especially as second post no longer exists. I think we should be supporting them all we can as talk of privatisation in a few years time could prove disastrous if the railways are anything to go by. Keep it simple I say, and let one company do the lot. After all the carping, I hope the media and the public will give credit where credit is due. Running an organisation on the scale of the Royal Mail cannot be easy - and to achieve such a turnaround in a fairly short time deserves some congratulations. If they can just convince their staff to turn up for work without needing to offer the chance to win a car, then they really will have made a success of it! I think this is a triumph of cost cutting over service. Our daily delivery is now often missed altogether, last collections are much earlier than they used to be and queues in post offices are longer than ever. The service standards have presumably been moved around to fudge the reality of continued failings. Fine, and well done to the hardworking postal staff, but we now only get letters delivered once a day at an unpredictable time ranging from eight am through to two pm. Useless when waiting for an important document! Profit at the cost of service quality! I still don't think the postal service is improving. A lot of post is delivered to the wrong address, arrives late, or possibly even stolen. My friend sent his passport via recorded delivery and they lost it ! The Royal Mail used to be the envy of the world. Now it yet another overpriced service. Hasn't Royal Mail met its targets because it shifted the goal posts? If there was the same commitment to 1st class delivery times there once was, they'd still fail abysmally. My business had to give up on sending invoices by post, because there was no guarantee if and whey would arrive. I now send my invoices and correspondence out electronically. I was once a great supporter of Royal Mail but now I'm indifferent, because the commitment on 1st class post was downgraded and the delivery times became random. Some people don't know they're born. The fact that it costs 30p to send a letter to Scotland, often, in one day doesn't impress you people? In the United States, it takes a week to send a letter to your next door neighbour! I once had a letter delivered to me with no house number or street. Just the town and post code and it found me. In my opinion, we have the best postal service in the world! Congratulations to the Post Office. Given the turnaround in the quality of service as well as turning in a profit, I think Adam Crozier's salary is deserved. Good to see that all staff are being rewarded with a bonus too. However much work is still to be done to ensure mail is delivered to the right address punctually. Please, please, please - it's not rocket science! If you're a monopoly (or near monopoly) and you gain permission from the government to increase your prices (i.e. for stamps) everyone using the service is forced to pay the increased charges and by default, your profits will increase. Perhaps we can have a reduction in the price of stamps as our bonus! Good on the post office. It's nice to see a large company giving something back to its staff. I'm sure its a great moral booster and a massive incentive to continue with the improvements. Good to see Royal Mail making a profit but when will they sort out mis-delivered mail? I have complained to the Royal Mail but they continue to deliver letters to my house that should be delivered to a house on a different road! I'm happy to hear Royal Mail's success, I also hope that this news spells the end of talk of privatising the mail service here in the UK. This news clearly indicates the system works well and any change would be to the detriment. Hmmm. Our post is shocking. On Friday last I received a first class letter posted to me on the 9th May. Our post often arrives after 1pm. Everyone likes to run down the mail service without knowing the first thing about it. On Breakfast this morning for example, the commentator said increased profits where all very well, but you don't get your mail until lunch time. He obviously has no idea of how much post a postie has to take out nor how long it takes to deliver it all. Someone has got to be at the end of the round just as someone will be at the beginning. 30p from one end of the country to the other - you couldn't do that by bus. Didn't Royal Mail fail all of the targets that they set themselves last year? And a £2.5m bonus for Adam Crozier? Try getting the thousands of people who have failed to receive letters each morning to swallow that one. Well done Royal Mail! What a fantastic effort. To turn things around like this is something that companies such as M&S could learn a lot from. Crozier and all the staff deserve every penny of their bonuses. Maybe they do get letters sent on time but what good is it if I get sent a package containing a record that's been bent in half in the post?